Beautiful Sherwood Green Finish with the perfect "level 1 In-Distress" relicing. Sounds and plays as good as she looks !!! Because of our special relationship with Anderson we can get this as fast, or faster than anyone in the industry. In some cases, we even have preferred build slots we can offer you. In this video, Sound Pure electric guitar specialist Eddie Berman plays an Anderson Icon Classic through a Mesa Boogie Fillmore and a Strymon El Capistan pedal. 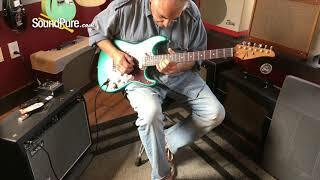 In this video, Sound Pure electric guitar specialist Eddie Berman Plays an Anderson Icon Classic through Mesa Boogie Fillmore and a Strymon El Capistan pedal. So you could say: Icon looks just right and plays just right. And almost every Anderson option is available, as long as it does not alter the time-honored look. Another interesting aspect of Icon is that many are ordered with Satin Finishes. We have the smoothest Satin finishes in all the colors. But if your preference is a shimmering shine we have all those wonderful Gloss colors as well. What is the one color that you have always imagined yourself holding? And what is the best part of dreams? It is the moment you awaken to find that reality now exceeds them.